For every ailment in today's world there is a pill. A solution in the form of a capsule or tablet or liquid with a concoction of chemicals inside designed to "cure" our misfortunes. Big Pharma has made their mark. As a pharmacist who's been in the medical field for over 10 years, I actually find this quite concerning given the pharmaceutical companys' primary motives for financial growth with little to no regard for patient safety and outcomes. The television commercials say it all. Drug companies are here to market, profit, and prosper off of sick people. You're of no value to them if you're in good health. This might be all well and good if the end goal was truly a nation, or a world, full of vibrant, healthy people who occasionally needed the help of Big Pharma to get back on their feet. But it's not. We live in an era where pill popping is the norm and weight issues and chronic diseases reign supreme. A quick look at the numbers confirms what we already know. 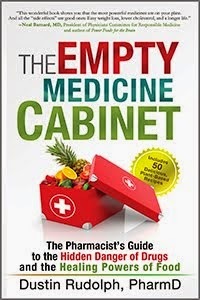 In 2011, a total of 4.02 billion prescriptions were dispensed at a grand total of $319.9 billion [1,2]. In case you were wondering, this amounts to approximately 12.9 prescriptions for every man, women, and child living in the U.S. at a cost of roughly $1,026.68 per year per person. Most of this isn't hitting our pocket books, not directly anyway. Insurance companies pay for the majority of the costs. In 2011, the average copay for 75% of all prescriptions dispensed in the U.S. was $10 or less thanks to the increasing availability of generic medications and prescription drug coverage . I could write an entire book on the statistics behind the legalized drug world, but I'll stop for now. If you care to look into the subject any further you can read the IMS Institute for Health Informatics report here. What's more important is looking at what we're getting in return for all these medications. Or better yet, what we're getting in return for all the money being spent on healthcare in America today. After all, it's only a mere $2.7 trillion or 17.6% of our entire GDP as of 2011 . 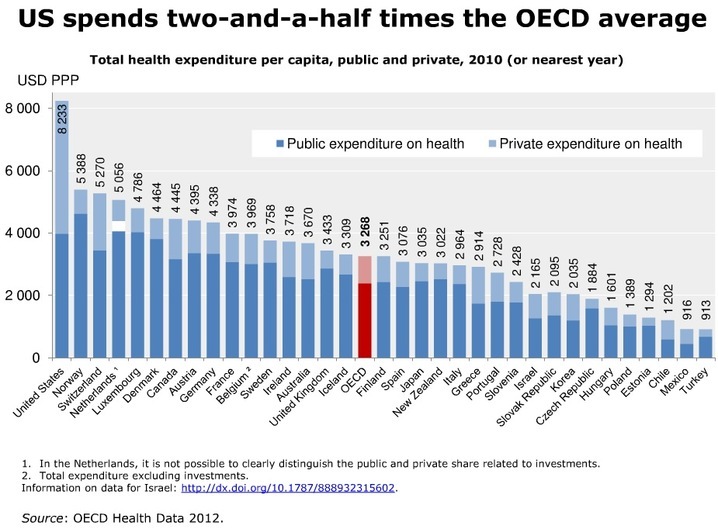 We are number one in the world when it comes to healthcare expenditures. Not bad for a nation who prides itself on lavish spending. 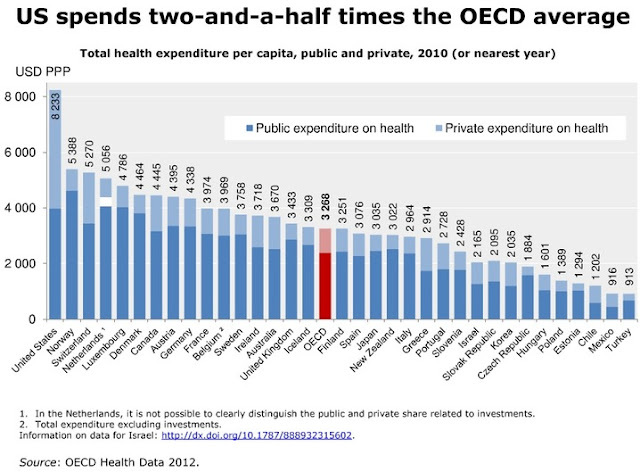 Despite our lavish spending on diseasecare, we're getting very little in return in terms of our health. Data from the World Health Organization in 2011 indicates that 87% of all deaths in the United States are due to chronic diseases (i.e. noncommunicable diseases) . Most of these are completely preventable. Many can even be reversed if treated appropriately and in a timely manner. But, more often than not, we don't treat chronic diseases appropriately. We throw pills and procedures at illnesses which actually require lifestyle modifications instead. Then we stand up and proclaim, "We have the best healthcare system in the world!" Really? Is this why two thirds of our nation is fat and sick? 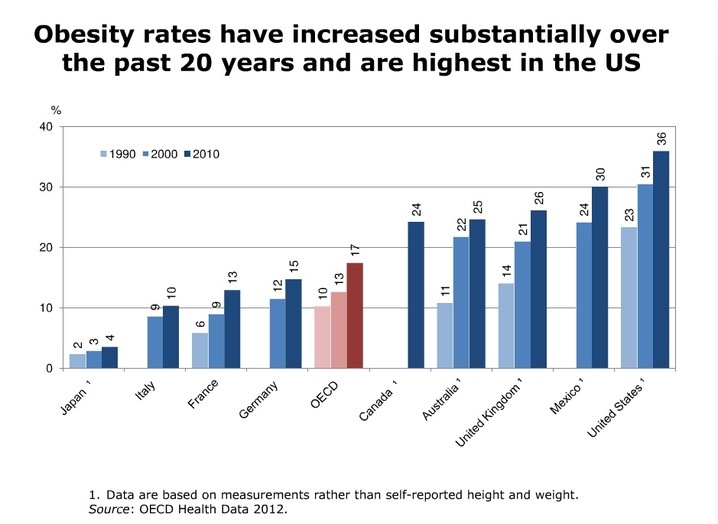 Is this why we top the obesity rankings amongst the rest of our peers in the developed world? To give credit where credit is due, I guess we're winning at something here in the United States. So where do we go from here? Do we continue to support Big Pharma and keep utilizing their products? And why are medications failing us when we keep taking more and more of them? Aren't they supposed to be treating our illnesses? If obesity is the main driving force behind the rise in deaths from chronic diseases then shouldn't we put a little more effort into this area of healthcare? I'm sure the pharmaceutical companies would love to get their hands on the next blockbuster weight loss pill, but is another pill the answer? First off, let's get one thing straight. 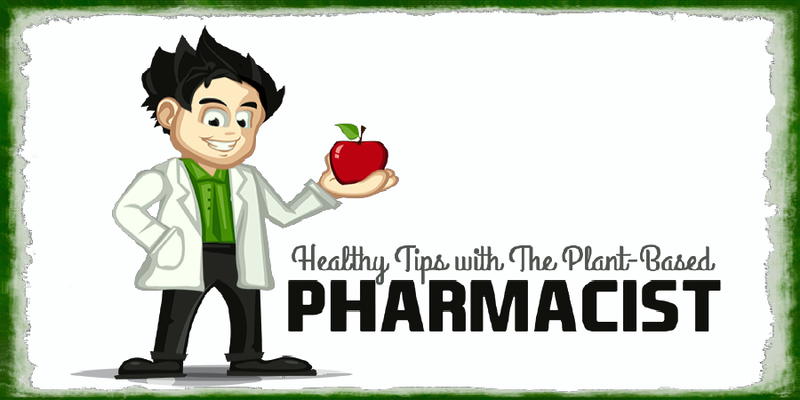 With few exceptions, medications treat SYMPTOMS and NOT underlying CAUSES of chronic disease. We DO NOT have a pharmaceutical shortage in our blood supply. This is not the reason we are sick. The grandeur of prescription medications, and the drug manufacturers who've created this compelling facade, have done wonders making us think this is the case. It is not. I'm here to tell you that pills will not solve your problems when it comes to regaining your health. 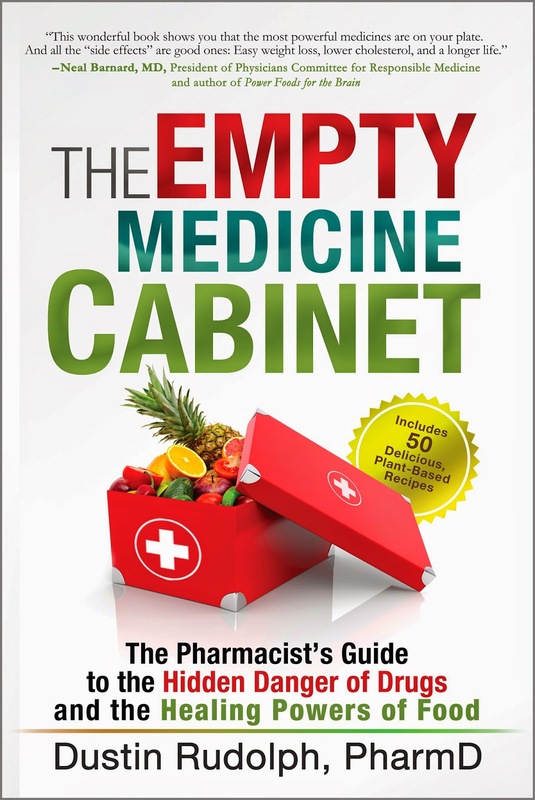 You need to look beyond your medicine cabinet when treating chronic diseases. Patient (with COPD and emphysema): Doc, I can't breath. I'm winded all the time. I keep getting upper respiratory infections. I'm miserable! Physician: You need to stop smoking. This is the cause of your breathing problems. I can give you inhalers and respiratory meds to help manage your symptoms, but you need to stop smoking. I have some wonderful resources, informational guides, and tools for you to use to accomplish this if you'd like. It'd be great to see you make these changes. It's the only path to true health, and I'm confident you'll reap the rewards of quitting smoking even though it may be difficult at first to do so. I know this isn't going to be easy, but it's worth it! I believe in you. Let me know what I can do for you. I'm here to help. This is good, responsible, evidence-based medical care. Even though the patient already knows the benefits of quitting smoking, it's important to remind them of this and offer assistance in doing so. He/she may or may not follow through but our job as a healthcare professional is to advise the patient on the safest, most effective, and least costly approaches in treating their medical condition. Patient (with heart disease, diabetes, constipation, high cholesterol, high blood pressure, etc. ): Doc, I feel horrible. I have no energy. My mind is in a haze half the time. I'm depressed. I have these sharp abdominal pains and cramps from time to time, and I'm not having regular bowel movements anymore. I'm worried because my latest wellness screening at my employer's health fair didn't go so well recently. My blood sugar, blood pressure, and cholesterol screenings were all high. Physician: I'm going to write you a few prescriptions. Lipitor for your cholesterol. Metformin for your diabetes. A diuretic pill and lisinopril for your blood pressure. Zoloft for your depression. Miralax and a stool softener for your constipation. Lastly, some Xanax and Levsin to calm the nerves in your stomach. Now, we need to schedule a follow up appointment so I can see you back in a month or so. The patient will come back in a month and the cycle will repeat itself over and over and over and over again. Medications will be changed, doses increased and decreased, with minimal, if any, results to show for it. The patient will never get better in terms of their long term health, and the doctor will become frustrated seeing their patient deteriorate over time. This is 21st century medicine at its finest. Physician: You need to be more active, start exercising, and stop eating the foods that cause these diseases. This includes meat, dairy, eggs, and processed foods, including vegetable oils. I can give you a number of medications, but they will only treat your symptoms. They do not target the root cause of your medical conditions. You have to stop eating animal-based and processed foods in order to do this and start your recovery period. This can be done by adopting a whole foods, plant-based diet. Patients who've taken this approach have ALWAYS gotten better to one degree or another. Many have made full recoveries, reducing or eliminating their needs for medications. I have some wonderful resources, an informational packet, and some support groups I can direct you to in order to get you started if interested. If you take this approach, I'm confident you'll reap the rewards of making such a big investment in your health, both short and long term, even though it may be difficult at first to do so. Just like it isn't easy for a smoker to quit smoking, it isn't easy to change what you're eating and your activity level, but it's worth it! I believe in you. Give this some good, hard thought and let me know what I can do for you. I'm here to help. This is good, responsible, evidenced-based medical care. However, it involves a change in mindset with respect to our current healthcare model both from the provider and patients' standpoint. Providers need to become educated on how to properly implement this new lifestyle in their patient's treatment plan. Patients need to become more open minded and expect a higher quality of service from their healthcare provider. This is a brand of medical care that targets the root cause of disease and not just the symptoms. Patients also need to be willing to take responsibility for their own health and their own actions. It all starts with simple changes on both ends. What is encouraging is that more and more healthcare providers and patients are learning of this approach to treating chronic diseases. I find this very promising for the future of our nation's health and well being. We all need to keep it going. Understanding The Ups And Downs Of Erectile Dysfunction. Hypertension (high blood pressure) is the leading risk factor of cardiovascular disability and death . At the core of hypertension is the build up of atherosclerotic plaques within our vascular system leading to stiff artery walls and a reduction in nitric oxide production. Nitric oxide is an extremely important substance produced by our endothelium (innermost layer of our blood vessel walls). It acts to dilate the blood vessels helping them maintain and regulate normal blood pressure control . It also helps keep the blood from becoming sticky by inhibiting platelet aggregation . Knowing these facts, it is clear how important it is to keep atherosclerosis at bay in order to avoid heart disease. Atherosclerosis, in turn, is caused by the high consumption of animal fats, saturated fats, and trans fats found in the rich, western diet . I'm going to repeat this because it is of utmost importance in understanding the root cause of nearly every case of heart disease across the entire planet, with only a few rare exceptions. Atherosclerosis is caused by the high consumption of animal fats, saturated fats, and trans fats found in the rich, western diet. These fats are in highest concentrations in meat, dairy, eggs, vegetable oils (including olive oil), and processed foods (pastries, cookies, frozen dinners, frozen pizzas, store-bought dressings, fast food, etc.). To successfully treat someone with heart disease the diet has to be changed. Dr. Caldwell Esselstyn, Jr. of the Cleveland Clinic has done just this as reported in his study published in the American Journal of Cardiology over a decade ago . Dr. Esselstyn took the sickest heart disease patients—patients rejected by modern medicine because they could do no more for them—and was able to halt and even reverse their cardiovascular disease by helping them adopt a whole foods, plant-based diet. This diet eliminated meat, dairy, eggs, and processed foods while allowing patients to eat all they wanted from the following food groups - fruits, vegetables, legumes, and whole grains. Medications were rarely, if at all, used. Dr. Esselstyn's work paved the way for a new approach to treating our number one killer—heart disease. We should take from his research the wonderful blessings it gives to us and share this life saving information every chance we get with others. His work has proven to ultimately be the most effective, safest, and least costly approach in treating cardiovascular disease. The results of Dr. Esselstyn's study are listed at the end of this article. Let's sidetrack for a moment, however, and take a look at conventional medicine's treatment of heart disease. Below are some common medications we use to treat heart disease today. I've shared with you how they work, potential side effects, and the reason they provide false hope when combatting cardiovascular disease. You may also want to check out Dr. John McDougall's article How I Treat Patients With Elevated Blood Pressure for another enlightening perspective on these treatment approaches. - Act by blocking the effects of the hormone epinephrine (adrenaline) which slows the heart rate and reduces blood pressure. - Do nothing to eliminate the intake of animal fats, saturated fats, and trans fats from the rich, western diet causing atherosclerosis, and ultimately heart disease, in the first place. - Act by increasing urinary excretion of sodium and excess fluid which reduces blood pressure. - Act by preventing calcium from entering the cells of the heart and blood vessels which lowers blood pressure. Some calcium channel blockers also reduce the heart rate. - Act by reducing the production of a substance called angiotensin II in the body. This works to relax blood vessel walls, reduce blood pressure, and increase sodium and fluid excretion from the body. - Act by blocking the actions of angiotensin II in the body. This helps dilate the blood vessels and reduces blood pressure. - Act by relaxing smooth muscle cells in blood vessel walls causing vasodilation to reduce angina or chest pain. - Act by decreasing cholesterol production in the liver, reducing LDL "bad" cholesterol levels in the blood by increasing LDL re-uptake into the liver for disposal, and reduces triglyceride levels. As you can see, medications do provide relief from heart disease. A decrease in blood pressure, reduction in cholesterol levels, and relief from chest pain are all possible with the use of medications. But what does all this really accomplish in terms of heart disease? Is a person's long term risk of suffering a potentially debilitating and fatal heart attack reduced or even eliminated by taking these drugs? The answer to this comes right back to the root cause of cardiovascular disease—the formation of atherosclerotic plaques. In order to defeat heart disease you must defeat the formation of atherosclerotic plaques. How do you do this? 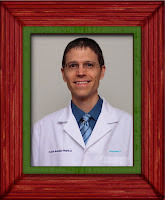 For the answer, we look no further than the highly respected work of Dr. William Roberts, MD. Dr. Roberts is a cardiologist who has published over 1,400 articles to date, almost all in peer-reviewed publications, mostly pertaining to heart disease and the pathology behind it. You can read more about his colorful and decorated background here. In April 2000 he wrote an article titled Twenty Questions On Atherosclerosis and addressed many common concerns regarding cardiovascular disease and atherosclerosis . Below are some highlights that will answer our questions. There answer is hypercholesterolemia. What level of total cholesterol and specifically LDL cholesterol is required for atherosclerotic plaques to develop? Symptomatic and fatal atherosclerosis is extremely uncommon in societies where serum total cholesterol levels are < 150 mg/dL and serum LDL cholesterol levels are < 100 mg/dL. If the LDL cholesterol level is < 100—and possibly it needs to be < 80 mg/dL—the other previously mentioned risk factors in and of themselves are not associated with atherosclerosis. In other words, if the serum total cholesterol is 90 to 140 mg/dL, there is no evidence that cigarette smoking, systemic hypertension, diabetes mellitus, inactivity, or obesity produces atherosclerotic plaques. Hypercholesterolemia is the only direct atherosclerotic risk factor; the others are indirect. If, however, the total cholesterol level is > 150 mg/dL and the LDL cholesterol is > 100 mg/dL, the other risk factors accelerate atherosclerosis. How effective are statin drugs compared with aspirin, beta-blockers, angiotensin-converting enzyme inhibitors, and calcium antagonists in preventing repeat atherosclerotic events? At least among patients who have had an acute myocardial infarction and survived, daily aspirin decreases the chance of recurrence of an atherosclerotic event within a 5-year period by 25%, beta-blockers by 25%, angiotensin-converting enzyme inhibitors (at least the tissue inhibitors) by 25%, calcium antagonists by probably 0%, and statin drugs by > 40%. Thus, if a person could take only 1 drug after a heart attack, the most effective one would be a statin. How effective are the statin drugs in preventing strokes? Very effective. The statin drugs decrease the frequency of strokes in a 5-year period by approximately 30%. Until recently the statin drugs were the only drugs other than an antihypertensive drug demonstrated to decrease the frequency of stroke. Recently, the angiotensin-converting enzyme inhibitor ramapril has been shown to decrease the frequency of strokes also by approximately 30%. Do statin drugs have to be taken every day for the remainder of life? Yes. Some patients apparently believe that the statin drugs need to be taken for only a few months—until the cholesterol levels come down. I believe that it is important to tell patients when they are first placed on a statin drug that they will need to take the drug every day for the remainder of their lives. Of course, if a patient subsequently becomes a pure vegetarian-fruit eater it might be possible to discontinue the statin drug, but few Americans are willing to go the vegetarian route." - After 12 years NO FURTHER CARDIAC EVENTS (strokes, heart attacks, etc.) and NO FURTHER PROGRESSION OF ATHEROSCLEROTIC DISEASE was seen in patients remaining compliant with a whole foods, plant-based diet. - Significant savings were experienced by those adopting a whole foods, plant-based diet in regards to lack of doctor bills, hospital bills, prescription copays, and lab tests. However, patients still had a grocery bill to pay at the end of each week. So how much of a reduction in atherosclerotic disease do you want after 5 years, 12 years, and the rest of your life? A 25% reduction? 40% reduction? Or a 100% reduction? It is nice to see that the 100% reduction comes along with no side effects and the added benefit of a 73% chance of reversing heart disease. So what will it be? Only you can answer that question. It's your life. Make the most of it! 1 IMS Institute for Healthcare Informatics. The Use of Medicines in the United States: Review of 2011. April 2012. 2 Lindsley CW. 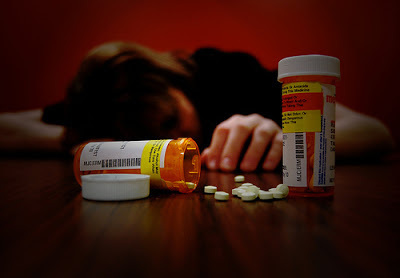 The top prescription drugs of 2011 in the United States: antipsychotics and antidepressants once again lead CNS therapeutics. ACS Chem Neurosci. 2012 Aug 15;3(8):630-1. doi: 10.1021/cn3000923. 3 Centers for Medicare and Medicaid Services, Office of the Actuary, National Health Statistics Group, National Health Expenditure Data. Available at: http://www.cms.gov/Research-Statistics-Data-and-Systems/Statistics-Trends-and-Reports/NationalHealthExpendData/NHE-Fact-Sheet.html. Accessed Feb 23, 2013. 4 World Health Organization. Noncommunicable diseases country profiles 2011. Available: http://www.who.int/nmh/countries/usa_en.pdf. Accessed Feb 23, 2013. 5 Chockalingam A. World Hypertension Day and global awareness. Can J Cardiol. 2008 Jun;24(6):441-4. Review. 6 Förstermann U, Nakane M, Tracey WR, Pollock JS. Isoforms of nitric oxide synthase: functions in the cardiovascular system. Eur Heart J. 1993 Nov;14 Suppl I:10-5. Review. 7 Riddell DR, Owen JS. Nitric oxide and platelet aggregation. Vitam Horm. 1999;57:25-48. Review. 8 Astrup A, Dyerberg J, Elwood P, et al. The role of reducing intakes of saturated fat in the prevention of cardiovascular disease: where does the evidence stand in 2010? Am J Clin Nutr. 2011 Apr;93(4):684-8. 9 Esselstyn CB Jr. Updating a 12-year experience with arrest and reversal therapy for coronary heart disease (an overdue requiem for palliative cardiology). Am J Cardiol. 1999 Aug 1;84(3):339-41, A8. 10 Roberts WC. Twenty questions on atherosclerosis. Proc (Bayl Univ Med Cent). 2000 April; 13(2): 139–143. Great article and needed so much. I'm pretty sure the pharmaceutical industry will not stop until everyone is on some kind of pill. I stopped taking medical advice when they tried to put me on HRT (hormone replacement therapy) when I was completely symptom free during menopause (thanks, I'm sure, to my vegan diet). Sadly, profit is always the ulterior motive. I agree whole heartedly with you Paige. The industry is all about profits and not about health. It's going to take a grassroots effort like that of yourself to produce change. Keep up the healthy lifestyle! Great article. I had a calcium deposit score of 608 which is high. My doctor put me on 80 mg of LIpitor, the highest dose possible and blood pressure meds March 17, 2016. I went on Dr. Esselstyn's diet that same day which I had read about 2 years prior. I have adhered to the diet 98% over that time and I do love it. I have experienced no hunger or deprivation. The Lipitor was too intense and caused severe side effects including muscle pains in my legs, terrible upper back pain, fatigue and mental fog. The blood pressure medication caused dry cough. I went off of the Lipitor in early August 1 due to the intense upper back pain. I had my cholesterol checked September 16, 2016 and through diet only it had dropped 80 points and the doctor said if anything my blood pressure was too low and I should immediately go off of the BP medication. I am a huge fan of Dr. Esselstyn's heart health diet. No Meds after six months when they had put me on the highest dose possible. So grateful. I sent Dr. Esselstyn a few emails and he has generously called me several times to encourage me and suggest diet tweaks. Oh, I have also lost 21 lbs. Before I started the diet I could only walk about 1/2 block before feeling breathless. I have been walking 2 1/2 miles 4-5 times a week since March 2016. This week I was able to run 1 mile of my 2 1/2 mile trek. I am a 66 year old woman. Thank you for educating people.